There is a conspiracy but this ain't it. You could tell people that the sun is the same size and distance as the moon and it would make no difference to them. If this was such a powerful illusion, then it would be powerful enough to prevent people from having such delusions. One AU is in fact 93,000,000 miles. Why do you not believe the data? Because you look at it with your naked eye and cannot fathom the reality of its size? Help us understand exactly why you believe this to be the case. A California blonde was asked which was closer, the sun or Florida. She said duh, the sun... I can't SEE Florida! I have got to ask you this question. Where in the World do you get these crazy...very easy to disprove...ideas? Just because you are ignorant, doesn't mean others aren't. There is no plan to mislead the masses about the size of the sun and it can be proven. At home. It's called a pinhole viewer and all you need is a piece of cardboard, a piece of tinfoil (not for your head), a piece of white paper and a ruler. 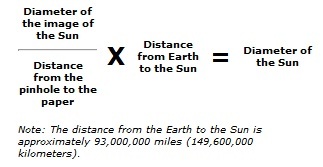 We are told that the average distance of the sun is 149,600,000 kilometres away (it varies depending on time of year of course), so if you are correct, the above formula won't calculate the diameter of the sun correctly (approximately 1,391,000 kilometres), right? If this was any other topic, I bet that I would agree with you Chad but I think the entire premise of the thread is that such logic and measure only applies when you look from within the "deception" itself. In other words, it's possible that you are using facts derived from a purposeful hoax to prove the validity of the hoax. It's a Catch 22, but the alternative is still within the realm of possibilities. The sun isn't really that far from the earth and noone has been misled. It's about ninety three million miles away. That's not really that far at all. A friend of mine logged over a million miles on the road a few years ago already. I've only put on about a half a million miles myself so far. Neither of us are semi drivers either, although my friend delivered newspapers and put half of his miles on doing that. I'm sure a semi driver could put six million miles driving in say fourty years. We are taught it is a long way to the sun in school and rarely try to put it into perspective. If a semi was traveling at 70 MPH for 24/7 for fifteen years it would probably reach the sun. I'm sure that seventy commercial jets fly more than 93 million miles per year if you add their miles. We assume things are different than they really are. We are taught about the suns distance when we are little and don't know bull crap about reality.